Effective November 27, The Hallmark Channel will be moving M*A*S*H's 11 p.m. to 1 a.m. ET/PT slot to 8 a.m. to 10 a.m. ET/PT. Why? Because they are preparing the new slot because by January they can only air the show between 8 a.m. and 8 p.m., because TV Land has rights in a shared window deal. TV Land will have rights from 8 p.m. to 8 a.m. ET/PT. So, Hallmark will air M*A*S*H from 8 a.m. to 10 a.m. and will continue to air it early evening from 5 p.m. to 7 p.m. ET/PT. The Waltons was previously airing back-to-back at 8 a.m. and 9 a.m. and now will be off the schedule. They still have rights until April, I think, so it could return. Replacing M*A*S*H at 11 p.m. will be Hallmark Movies. Click here to view the changes and to discuss it. It was the best of times, it was--well, the best of times! In the decade between 1974 and 1984, the Paramount lot was a cauldron of creativity, talent, and innovation. 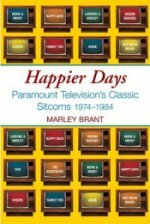 Marley Brant, brings her influence and years of access together in HAPPIER DAYS: Paramount Television’s Classic Sitcoms 1974-1984 (Billboard Books; $16.95; October 2006), a behind-the-scenes look at Happy Days, Taxi, Cheers and more than a dozen other television series produced there during a decade of madcap inspiration and accomplishment. In the interim between the debut of "Happy Days" and the final episode of "Cheers," many of the entertainment industry's biggest stars, best writers, most skilled directors and most successful producers were discovered or their already established talents nurtured, lifelong friendships and renowned professional alliances were created, and the landscape of the television sitcom was definitely altered. The talent was tremendous: Robin Williams, Tom Hanks, Ron Howard, Martin Short, Michael J. Fox, Henry Winkler, Penny Marshall, Andy Kaufman, Donna Pescow, Danny De Vito - actors who would become superstars, many appearing in their first starring roles. Through a series of intimate and revealing interviews, her own firsthand knowledge and exhaustive research, former Paramount television publicist Marley Brant takes us behind the scenes of these legendary shows for an up-close and personal look at the talented people who brought them to life. Brant examines the personal and professional roots of the creative talent, the evolution of the shows, the intricate relationships among cast members, and the creation of some of the most popular episodes, as well as taping sessions, guest stars, and where the actors and crew are today. Packed full of insider information, anecdotes, cast lists, biographical facts and little-known or previously unpublished stories, Happier Days is the definitive chronicle of some of the most creative sitcoms of all time. Marley Brant is the author of seven books, many of which have been the featured research for television programs that have aired on A&E, The History Channel, VH1, TBS, and CMT. Brant has held many positions in the entertainment industry, including biographical writer, publicist, artist development executive, and music and television producer. Employed in the publicity office of Paramount Television in the late seventies and early eighties, she worked closely with the cast and crews of Paramount’s premier television productions. Recent interviews were conducted with Director Jim Burrows, Randall Carver, Pam Dawber, Corey Feldman, Michael Gross, Clint Howard, Donna Pescow, Misty Rowe, Suzi Quatro, and Director Howard Storm. Chapter 1 - Before A Live Audience - This section gives some details on the tapings of Happy Days, Laverne & Shirley, Mork & Mindy, and Taxi. The tapings were often anything but predictable. What an experience it must have been to see an episode being taped. Chapter 2 - Three Creative Forces Explode - Garry Marshall, Michael Eisner, and Barry Diller are profiled and details are given on how they got started in the business. Chapter 3 - Love in the Happy Days - This section focuses primarily on the first season of Happy Days. It details how the pilot aired as an episode of Love, American Style. Casting and biographical information is given for Ron Howard, Henry Winkler, Tom Bosley, Marion Ross, Anson Williams, Donny Most, Erin Moran, Gavan O'Herlihy, Randolph Roberts, Pat Morita, and various crew members. Chapter 4 - Hello, Blue Skies - Seasons 2-11 of Happy Days are detailed. Al Molinaro, Suzi Quatro, Misty Rowe, Scott Baio, Beatrice Cohen, and Roz Kelly are profiled. Various topics covered include the guest stars, catchphrases, and the softball team. Misty Rowe (Wendy the Carhop) and Suzi Quatro (Leather Tuscadero) are interviewed. Chapter 5 - Making Their Dreams Come True - Happy Days spin-off Laverne & Shirley is the focus here. Casting and biographical information is given for Penny Marshall, Cindy Williams, Eddie Mekka, Phil Foster, Betty Garrett, David L. Lander and Michael McKean. The fighting between Penny Marshall and Cindy Williams is detailed. Chapter 6 - Triumph and Tribulation - More information is given on Laverne & Shirley. Cindy Williams was often unhappy with the writers of the show, and once filed a lawsuit against the producers. There were some funny behind-the-scenes stories on the competetiveness between Penny and Cindy. Chapter 7 - Mork Calling Paramount - Garry Marshall's son, Scott, wanted to see a show with a space alien, so that is where the idea for Mork & Mindy came from. Interestingly, Robin Williams wasn't originally supposed to play Mork and another actor played Mindy's father. Robin Williams, Pam Dawber, and the other cast members are profiled. Many interesting factoids are given, and the interviews with Pam Dawber and Director Howard Storm added a lot to this section. Chapter 8 - Nanu Nanu Means Success - Seasons 2-4 of Mork & Mindy are detailed. Robert Donner, Jay Thomas, Gina Hecht, Jim Stahl, and Jonathan Winters are profiled. Guest star Corey Feldman is interviewed. A lot of the changes for the second season are discussed. As they always say, you never mess with or move a hit show. Moving Grey's Anatomy to Thursdays seems to have worked alright for ABC, though. Chapter 9 - Hey, Taxi! - The development and first season of Taxi are discussed in great detail. I wasn't very familiar with Taxi before reading this section, so a lot of this information was knew to me. Profiles and the casting information is given for Juddd Hitrsh, Danny DeVito, Marilu Henner, Tony Danza, Jeff Conaway, Randall Carver, and Andy Kaufman. There is some fascinating information on Andy Kaufman's contract and other casting details. Randall Carver is interviewed. Chapter 10 - A New Kind of Family - Seasons 2-5 of Taxi are discussed. Rhea Perlman and Carol Kane bios are given. A lof of behind-the-scenes details are given on Jeff Conaway's problems and Andy Kauffman's wrestling career. The move from ABC to NBC is also detailed. Chapter 11 - Different Worlds - The short-lived series, Angie, gets its own section. Donna Pescow, Robert Hays, Doris Roberts, John Randolph, and Debralee Scott are profiled. Due to some time slot changes, the show lasted only 36 episodes. Donna Pescow is interviewed. Chapter 12 - Bears, Associates, and Cross-Dressers - This section covers The Bad News Bears, The Associates, Bosom Buddies, and several other short-lived sitcoms. Jack Warden, Corey Feldman, and the rest of The Bad News Bears cast are profiled. Corey Feldman is interviewed and shares his experiences on working on the show. Wilfrid Hyde-White, Martin Short, Joe Regalbuto, Alley Mills, and Shelley Smith from The Associates are profiled. Despite running only 9 episodes, this show received a number of award nominations. Biographical information for Goodtime Girls actors Georgia Engel, Annie Potts, Lorna Patterson, Camille Rittenhouse, and Adrian Zmed is given. Finally, there is some information on Bosom Buddies. Tom Hanks, Peter Scolari, Wendie Jo Sperber, Donna Dixon, Telma Hopkins, Holland Taylor, and Lucille Benson are profiled. Interestingly, Tom Hanks and Peter Scolari were not the producer's first choices to play Kip and Henry. Chapter 13 - A New Family in Town - Family Ties (finally coming to DVD!) is the focus here. Creator Gary David Goldberg, Michael J. Fox, Meredith Baxter, Justine Bateman, Tina Yothers, Marc Price, Scott Valentine, Tray Pollan, Brian Bonsall, and Courteney Cox are profiled. There is some interesting information on who else was considered for the roles of Steven and Alex P. Keaton. Michael Gross is interviewed. Chapter 14 - Cheers to You - The bar where everybody knows your name is discussed in detail. Ted Danson, Shelley Long, John Ratzenberger, Nicholas Colosanto, Woody Harrelson, Kelsey Grammer, Bebe Neuwirth, and Kirstie Alley are profiled. Many topics are discussed including the death of Nicholas Colosanto, adding Woody Harrelson to the cast, and Shelley Long's departure and Kirstie Alley's arrival. Director Jim Burrows is interviewed. The Legacy - This section gives some information on where the cast members from Happy Days, Laverne & Shirley, Taxi, Mork & Mindy, Angie, The Bad News Bears, Bosom Buddies, Family Ties, and Cheers are now. There is also some information on the behind the camera people including James L. Brooks, James Burrows, Michael Eisner, Gary David Goldberg, and Garry Marshall. Timeline - A listing of the Paramount shows mentioned in the book with their first and last episode dates. Selected Credits - Cast, Producers, Directors, Writers, and Casting information for Happy Days, Laverne & Shirley, Taxi, Mork & Mindy, Angie, The Associates, Bosom Buddies, Family Ties, and Cheers. Sources - The various books, interviews, and internet sites used for research information. It was a thrill to see 5 of my own sitcom sites listed! Index - A handy index of the actors, shows, episodes, and other details mentioned in the book. Final Comments: This book is as entertaining as the shows covered in it. Five of the sitcoms featured in this book (Happy Days, Laverne & Shirley, Mork & Mindy, Family Ties, and Cheers) are among my all-time favorites. I've read quite a bit information on these shows over the years, but this book provided even more new details to me. It was fascinating to see how some of the episode storylines came about and who else was considered for some of the roles. The interviews with the various cast and crew members added a lot of depth and insight into the shows. I would have loved to see even more interviews to provide behind the scenes details, especially from the Happy Days cast. This book is well organized and researched (I especially liked how the did you know? type facts were inserted), and I highly recommend it to any fans of the sitcoms covered in it.